Magpie Salmagundi: Confused by "polywassernames"? A good article if, like me, you'd have a hard time explaining exactly what a hydrogenated fat is. The margarine vs butter war continues. I can't believe it's not … healthy! First butter was bad for you, then margarine. Now a new front has opened in the battle of the spreads, with fresh calls for trans fats to be banned. But will any of this really prevent heart disease? The butter v margarine wars, so reminiscent of 1970s advertising, were back this week. A flurry of headlines about which type of fat is better for you announced their return, just as the Food Standards Agency (FSA) was trying to launch its carefully calibrated campaign to reduce our unhealthy level of saturated fat consumption. Leading doctors, in the form of the respected Faculty of Public Health, called for a ban on trans fats to cut obesity and heart disease, for which read artificially hardened margarines and fats in biscuits, cakes, snacks, spreads and fast foods. At the same time, a heart surgeon from University College London hospital (UCLH), Professor Shyam Kolvekar, called for a ban, not on trans fats in margarines and spreads, but on butter, to reduce the sort of artery damage he sees in victims of heart disease. The FSA called for a ban on neither, focusing instead on changing our milk and meat habits. Confused? You are meant to be. The wars between the industrial fats and the dairy industries have been fought on and off for more than a century. Conflicting commercial interests have long determined what type of fat we absorb into our bodies, and made an art of co-opting the medical profession. They are as active as ever. It was when watching an advert for polyunsaturated margarine in the late 1970s that the bizarre relationship we have with fat first struck me. The message seemed to be that not only did real men not eat quiche, they really ought to give up butter too. "Stop, ought he to be eating Flora?" "The margarine for men." "Isn't it time to change your husband?" No doubt there were others for other brands, but Unilever's stuck in my mind. "What does Mum do? Polywassernames …"
The ads marked my first awareness that instead of being allowed the pleasure of eating foods such as butter that had been happily consumed for centuries, we were being encouraged to think of food as potentially dangerous. The official advice at the time was that we should substitute saturated fats and cholesterol in the diet with polyunsaturated fatty acids, and manufacturers such as Unilever were quick to find ways to help us. Kolvekar's call for a butter ban this week turns out to have been timed to coincide with the FSA's campaign, by a PR agency called KTB, that also runs the account for two of Unilever's fat spreads: Flora pro.activ and Bertolli Light. The agency also runs what it calls a saturated fat information service, satfatnav.com, which is "brought to you by Unilever". In the KTB press release, the eminent heart surgeon is quoted giving calculations on the value of switching from saturated butter to fat spreads based on Flora. I asked the FSA whether it thought the latest "ban butter" intervention was helpful. "The FSA does not agree with banning any food," it told us. Kolvekar was unavailable to discuss why he had made the call this week, but a UCLH spokeswoman said his views were personal ones that did not necessarily represent those of the NHS trust. She said there was no financial link either between Kolvekar or his company KK Media Services and Unilever but said KTB had paid a fee to the hospital for filming Kolvekar performing heart surgery as part of Unilever's campaign to highlight the dangers of eating too much saturated fat. Unilever confirmed that Kolvekar has never received payment for his regular support for Unilever's heart health campaigns. He does it because he passionately believes in it, they said. The margarine and spreads industry has cultivated close links with the medical profession since the 1950s, when scientists sounded the first alarms about the epidemic of heart and circulatory disease in the west. By the 1960s these diseases had become big killers. Heart disease still causes about one in five deaths in men and one in six in women, even though rapid advances in treatments have brought the death rates down since the 1980s. In the early days cholesterol in the diet was said to be part of the problem, though this notion has now been discounted. Raised blood cholesterol is a risk factor for heart disease, but there is no direct correlation between cholesterol in the diet and levels of blood cholesterol. Gradually the current consensus emerged: that it was too much saturated fat in the diet that raises blood cholesterol. Doctors were asked to work with the industrial fats industry to come up with polyunsaturated spreads that could be substituted for dairy products that were high in saturated fat. NHS dieticians were encouraged to recommend them. Thanks to millions spent by the industry on advertising and sponsored public health education campaigns, margarine managed to put itself at the forefront of the fight against heart disease. That it did so was remarkable, since margarine had spent most of it brief life as a decidedly poor relation. Originally developed by a French chemist in the late 19th century, margarine was a response to a call from the French government to invent a cheap, long-life butter substitute that could feed its armies on the march. When the Dutch took up the process they imported rendered animal fat from the notorious Chicago meatpacking yards. Organisation among workers helped raise wages and push up prices, stimulating the development of technology to take cheaper liquid vegetable oils and artificially harden them. The physical properties of fats reflect their chemical properties. Polyunsaturated oils are usually liquid at room temperature. Saturated fats, on the other hand, are relatively solid. The process of hydrogenation allows manufacturer's to alter the molecular structure of oils to change their melting point. They can thus create different fats for different effects: chocolates with fats designed to melt at mouth temperature, or baking fats that are harder, to make croissants crisp. Hydrogenation involves mixing vegetable oils with a metal catalyst and heating them to high temperatures. Hydrogen gas is then pumped through the hot oil in a high-pressure reactor. Fully hydrogenated fat is incredibly hard, like plastic beads, but the process can be stopped part-way when manufacturers want oils that are still soft but more stable, and it is this partial hydrogenation that creates trans fats (see panel). Hydrogenation opened the way for a transformation in European fat consumption. The oils used varied depending on economic conditions. Vegetable oils from the colonies in Africa took their turn with the cotton seed oil that was a byproduct of the US cotton industry and even with whale oil. The fight against heart disease gave a big boost to the margarine industry and the 1960s saw a rush of new products. Flora was launched in 1964 and advertised on TV in 1965. By 1970 Unilever had begun promoting its use direct to the medical profession, and through the 70s and 80s Flora built a following as the brand that was high in polyunsaturates and better for you. There have always been sceptics of the fat = heart disease hypothesis. They point to the French paradox – that the French eat large quantities of butter, cream and meat but do not suffer high rates of heart disease. They also point out that many of the studies that have switched people to low-fat diets have not produced the expected decline in rates of disease. But the great blow to the fat industry, built on claims around heart health, came in the 1990s. Early in the decade, scientific evidence emerged suggesting that the trans fats produced by hydrogenation affected foetal and infant growth. Then in 1993 Professor Walter Willett, the principal investigator in the Harvard nurses study – on which much of the current advice for heart disease and cancer is based – published evidence that nurses in the study who ate significant amounts of trans fats were twice as likely to have a heart attack as those who consumed few trans fats. In 1997 he called hydrogenation "the biggest food processing disaster in US history". In 2004 he told an interviewer that the advice to switch from butter to vegetable oils hydrogenated into margarine had turned out to be "a disastrous mistake". When hydrogenated, the polywassernames were seriously bad news. The official advice had in fact made things worse. In Britain in 1993, an entrepreneur took out adverts for a "Whole Earth Superspread" made without hydrogenated fat, presenting consumers with "the facts that could save your life". The entrepreneur was Craig Sams, a Californian who went on to chair the Soil Association and to launch Green & Black's organic chocolate. Hydrogenation of fats had never been allowed in certified organic foods. His advert said that trans fats from hydrogenation were the biggest single dietary hazard of our time. Unilever, as manufacturer of Flora, complained to the Advertising Standards Authority. Sams lost and was told not to use his adverts again, not on the grounds that his information was inaccurate, for he had mounted a vigorous defence, pointing to the science, but on the grounds that the advert appealed to fear to sell its products. Sams was monitoring commercial rivals' products at this point, and said his tests found that Flora contained 21% hydrogenated fat at the beginning of his campaign for his new Superspread, but that even as Unilever was complaining about his ad, it was altering its flagship product. But for an uncomfortable period, Unilever found itself selling a product marketed as being good for your heart when it was heavy on trans fats now known to be bad for your heart. I put the figures and the account Sams had given me to Unilever in 2006 and asked why it had continued to market margarine with trans fats as healthy, when the evidence had come out against them. Its director of external affairs Anne Heughan told me that Unilever's work with polyunsaturated fats had begun when doctors approached it in 1956 to come up with a product that would help in a practical way to achieve what scientists and public health policy makers wanted: for the population to cut its intake of saturated fat. It had thought, like everybody else, that it was doing the right thing. "As a responsible manufacturer we can only go with the evidence at the time. When Walter Willett's evidence in 1993 indicated that trans fatty acids were as bad as saturated fats we felt that the weight of evidence had moved and we set about removing them. It took about two years." Flora was free of partially hydrogenated fats by the end of 1994. Unilever changed its other brands slightly later. The company told me that before reformulation, its spreads contained an average of 19.3% trans fats. The average for Flora was 10%. By 2004 trans fats had been reduced to less than 0.5% in all its fat spreads. Although Flora was not made with hydrogenated fat after 1994, a large number of other fat spreads were until very recently. When a researcher and I conducted a survey in 2005 of what was on sale in UK supermarkets and asked manufacturers what type of oil they used and how it was processed, Unilever was clearly ahead of the rest in removing hydrogenated fats. A decade after science confirmed the problem, parts of the industry were still dragging their feet, one of the reasons the Faculty of Public Health doctors have spoken out on trans fats this week. The evidence for the role of saturated fats in cardiovascular disease is strong. WHO advice is still that they should be replaced with polyunsaturated fats. But looking back, what is remarkable about much of the advice is how subject to revision it has been. 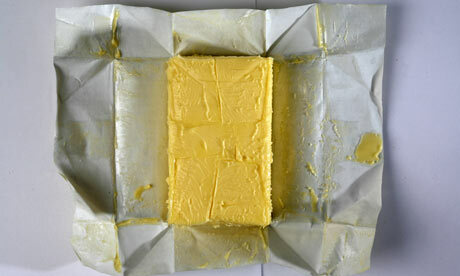 Not surprisingly, the public has become sceptical and retreated to natural products such as butter. Butter and fat spreads between them make up just one-eighth of our total fat intake. In the UK, the biggest source of fats overall and of saturated fat in particular is meat, particularly highly processed meat products such as sausages and pies. Cereal products including biscuits, cakes and breads are the next biggest sources of fat, then milk products. Butter and fats spreads come after that, which begs the question why they became the frontline in the war on saturated fat in the first place. Potato snacks and crisps account for about the same amount of fat, and it is the shift to an overwhelmingly industrial fast-food diet that really needs to be addressed. So why does Unilever continue to focus on promoting healthy spreads, the latest of which contain cholesterol-lowering ingredients? "The brand has consistently and effectively campaigned on issues such as heart health and cholesterol awareness – for which we make absolutely no excuses," a spokesman said. City analysts JP Morgan point out a further powerful commercial reason in their report on how the food industry is responding to the obesity crisis. According to their estimates, Flora pro.activ fat spread sells at a premium of more than 300% on standard products.